Growing up in Boulder, Colorado, Lao Tizer took classical piano lessons from age nine to fifteen, but the keyboardist/composer’s exotic given name-and his father’s extensive collection of World music-ensured that he would not limit his life to American suburbia playing just one style of music. Almost from the moment his birth certificate was filled out, the 31-year-old Lao, who began recording solo keyboard albums when he was 14, was destined to be a musical citizen of the world. Over the past year, he and his high energy band of versatile jazz veterans (collectively known as “Tizer”) took their fiery but always grooving and melodic brand of jazz and rock influenced world fusion around the world, galvanizing thousands at the Java Jazz Festival in Jakarta, the Joy of Jazz Festival in Johannesburg, the Dubai Jazz Festival and the Barbados Jazz Festival. This summer, the band—whose live on stage lineup can range from four to seven members, due to occasional outside commitments—is set to play the Hartford Jazz Fest (July 17), Columbus Jazz & Rib Fest (July 23), the Caribbean Sea Jazz Festival in Aruba and a date at SoCal’s premiere jazz hotspot Spaghettini’s (July 30). Tizer is also playing at Yoshi’s in San Francisco July 29. While Lao was a Best New Jazz Artist nominee in 2002 and his album Diversify spent many weeks on the Billboard Contemporary Jazz chart, the band doesn’t see themselves strictly as a jazz ensemble. They can prove it with a diverse resume that includes opening slots over the years for Zappa Plays Zappa, Jethro Tull, Isaac Hayes, Al Jarreau, Spyro Gyra, George Benson, Bruce Hornsby and Robin Thicke. Those who haven’t experienced their intensity, expansive arrangements and exciting soloing in concert yet have the next best thing in the band’s new CD Tizer Live, which captures the vibrant interaction of Lao, Andre Manga (bass), Jeff Kollman (guitar), Steve Nieves (sax/vocals/percussion), Raul Pineda (drums and percussion), Chieli Minucci (guitar) and Karen Briggs (violin) onstage at the globally renowned Musicians Institute (MI) in Hollywood. The concert recording takes seven songs culled from Lao’s earlier recordings Golden Soul (2001) and Diversify (2006) to dynamic new places; footage from the show is spliced with interview clips with band members to create an unforgettable 20 minute promo video, available for viewing on Lao’s website and (in two parts) YouTube. Group member and frequent featured guest, renowned jazz guitarist, composer and producer Chieli Minucci has recorded over 25 CDs as a solo artist and co-founded the renowned Grammy Nominated jazz world fusion group Special EFX; he has also worked with numerous pop greats, including Celine Dion, Lionel Richie, Jennifer Lopez, Jewel and Mark Anthony. Minucci has been a champion of Lao’s music and a frequent collaborator whose ties to Lao are the longest of any of the band’s members; he first met the keyboardist when Lao moved to L.A. in 1997 at age 18 to pursue his musical dreams. He helped Lao form his original Tizer lineup in 1998 (now consisting of the aforementioned Kollman, Manga, Pineda ,Nieves and alternate bassist Rufus Philpot), produced Lao’s 2001 release Golden Soul, appeared on Diversify and co-produced Lao’s last album Passages. Violinist and frequent guest Karen Briggs, who made her Carnegie Hall debut in 1994 with Dave Grusin, is renowned for her multiple tours with Yanni and has worked with Kenny Loggins, Chaka Khan and En Vogue. 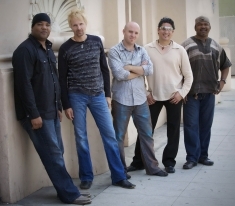 Andre Manga has played bass for Josh Groban and is bassist and musical director for Angelique Kidjo, while Tizer’s alternate bassist, Englishman Rufus Philpot is musical director for groove band Down To The Bone and has played with jazz legends Allan Holdsworth, Randy Brecker and Al Di Meola. Steve Nieves has worked with Loggins & Messina, Clint Black, Special EFX and formed his own pop/jazz band Jango in the early 2000s. Cuban drummer Raul Pineda has performed and recorded with Chucho Valdes, Michel Camilo and Juan Gabriel. Lao’s longest term band member and worldwide Fender clinician Jeff Kollman, who produced Lao’s 2006 release Diversify and co-produced Passages with Minucci, has been voted among the top 20 favorite guitarists in Young Guitar Magazines readers poll. He has played and or recorded with Jill Scott, UFO, Glenn Hughes (Deep Purple), and Miranda Lambert in addition to his latest venture with his 70’s influenced rock /funk group The Bombastic Meatbats featuring the legendary rock drummer Chad Smith (Red Hot Chili Peppers). He has written and produced 14 solo and band recordings on his own label and has written songs for film and television with credits including “Sahara,” “Failure To Launch,” “Clerks 2” and “Fantastic 4.”. For Lao, Tizer’s ventures into the musical wilds of places like Indonesia and South Africa culminate a journey which started humbly as a 14-year-old street musician, busking at the Pearl Street Mall in Boulder. His main goal was to earn enough money to repay his parents the loan for his first keyboard, and he did this many times over—and earned representation and many regional festival gigs in the process. In Los Angeles, to complement Tizer’s early slate of gigs at such spots as the Key Club and House of Blues, he continued his street musician ways in the loftier setting of Universal City’s famed CityWalk—where his explosive solo performances would help him sell hundreds of independently released CDs per night.